Several months ago I was approached by Damien to ask if I would be interested in testing an insole system designed to help rehabilitate feet with the types of conditions I have. Months before his request, Damien had been instrumental in encouraging me to take a different approach to dealing with the shin splints that had plagued me most of my adult life and that had almost completely put an end to my recreational running. His suggestion was simple, move to a minimal/barefoot style of running and a minimal shoe - the results were astonishing, shin splints went away, I was able to slowly build up my endurance, get back to running, and well... you know how that story goes. Yet despite being able to run without shin splints, I still suffered from the side effects of having flat feet and Plantar Fasciitis pain or PF. 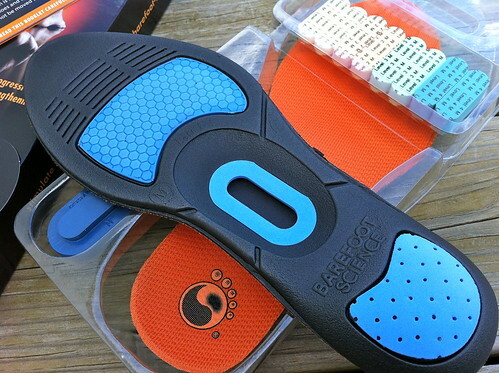 The insole system that Damien was asking me to test was designed specifically to help people, like me, that are active but have flat feet or PF and want to strengthen their feet, leg, knee, hip, back, and shoulder pain. I've had flat feet and the related symptoms all my life and can remember the look of horror on my mother's face when as a kid I used to wear through my sneakers and shoes twice as fast because of my over pronating. To top it all off, I was born with a defect in the Achilles tendon on my right leg that resulted in multiple surgeries, splints for several years and orthopedic inserts to 'fix' my twisted foot - none of which worked. When Damien asked if I wanted to test the insoles I was initially very reluctant and highly skeptical of any product that claimed to be able to help rehabilitate my feet in 6-8 weeks. After some additional encouragement by Damien I agreed to test the insoles and record my progress as best I could. 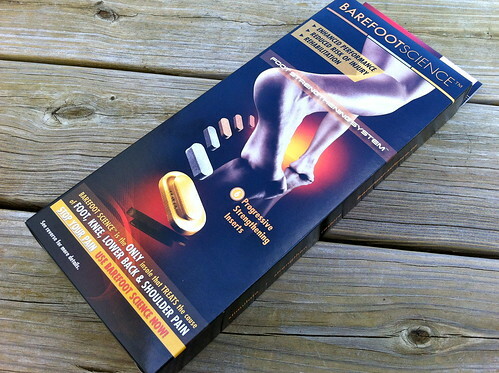 I received the Barefoot Science System in December 2011 and started with the system in the second week of that month. It is commonly believed that having flat feet is a bad thing, but that is a misconception. Having weak flat feet is bad. I was very fortunate that just before I started the Barefoot Science System I received an email from the inventor, Patrick Malleret. He was very interested to learn that I was testing his insole system and offered to answer any questions or address any concerns that I might have prior to starting. After mentioning my specific issues, Patrick suggested that I take it slowly and listen to my feet as I progress through the stages. He advised that I may have to repeat some of the different levels in order for my feet to feel comfortable, which he would consider to be absolutely normal. There are three types of Barefoot Science systems available, I am testing the 'Active' version. 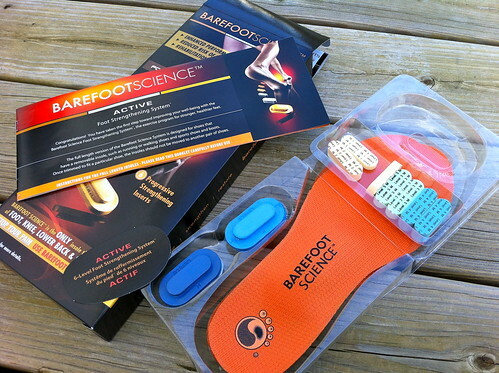 The Barefoot Science system is said to work differently than traditional insoles that merely cushion the foot. This system is designed to stimulate and strengthen the foot's supporting muscles as you advance through the progressively higher insert levels. 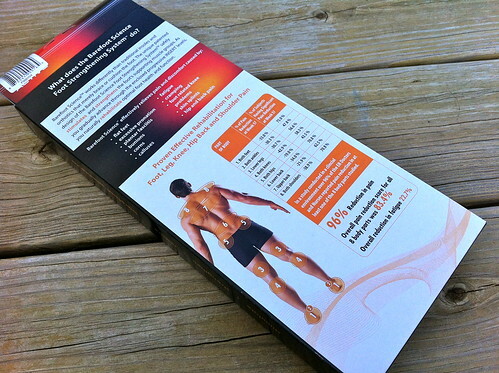 It's a 6-week program with a new (thicker) insert level each week. Although the system is typically a 6-week program, I will say that I definitely found it necessary to progress more slowly and listen to my feet rather than rush through it. The guidelines provided in the usage instructions are for 'everyone' or generic. Each person is different. The following is a chronological account of my progress through the progressive stages of the Barefoot Science system. It took me approximately 13-14 weeks to progress through all of the stages, much longer than the advertised 6-8 weeks, but even at that pace it felt as though I was constantly keeping up the pressure on the soles of my feet and ankles. Knowing that this could be potentially quite traumatic for my feet, and at the advice of the inventor, I decided to begin by using just the insoles in my shoes and none of the small foam inserts or plugs. Typically you would begin with the insole and put the #1 stage plug into the underside of them, but the slightly harder EVA dome of the insoles was more than enough to kickstart the stimulation of my feet in week one. With the addition of insert #1 my feet could immediately feel the difference. It felt like I had a rock or a pebble trapped under the insole of my shoe. It was quite uncomfortable at first, more so on my right foot, and caused me to reduce the amount of time I wore my shoes during the first few days of the new insert. My feet took a long time to get used to the sensation and the pressure of the new insert and it was clear that this was triggering the nerves in the soles of my feet more than anything else. I noticed too that this system was not targeting the arch section of my foot like nearly all of the previous inserts I had used. These were focused directly in the center/middle of my foot where, I assume, a lot of the nerve endings are. I decided to repeat the week with the #1 insert to allow my feet to have more time to adjust to the feeling of having so much additional pressure in the bottom of my foot. This was one of the hardest transitions of the entire system for me. I can best describe this as like having a marble in your shoe, under the middle of your foot as you walk. To my complete surprise, the #2 insert required far less time to transition that the first one. I could feel the incremental difference for sure, but the sensation was not too disimilar than what my feet were already feeling. I noticed no specific side-effects from moving up to the #2 insert (well except that my shoe laces had to now be tied more loosely than before to accomodate the increased height of my foot in the shoe) so I felt no need to repeat this stage for a second week. Just like with the #1 insert, my feet really felt the change when I moved up to #3. I also began to feel some slight aching and pain in my ankles and knees at this stage too. Most of the discomfort was still more neurological than anything else, but I could tell that the change in my foot position was starting to impact other parts of my body, progressing up as the weeks went on. I noticed the changes were always far more prominent in my right foot than my left, almost to the point where I felt as though I could have been one more insert ahead on my left foot than my right in order to have the same sensation. However, I'm no expert in these matters and decided that it would probably do more harm than good. Shortly after progressing to the #4 insert I noticed that I was beginning to have a little lower back pain and discomfort. Not too long afterward I made an appointment to see my chiropractor to have it looked at - yes it was that bad. I have a great chiropractor who just happens to be a good friend too. He was able to help with my discomfort and after being told about the inserts that I was testing told me that this was probably related to the changes in my posture. "This is possibly the best news you have had so far! Imagine a person with flat feet. Their knees buckle inwards with a consequent result that their psoas area (hips/pelvis/lower back) is obliged anatomically to pitch forwards at the pelvis. It is the human body's natural solution to flat feet occurrence. Once you begin rehabilitating those flat feet, the knees begin to align and the stress is taken off the hips/pelvis/lower back thus allowing everything to become more erect. It can be no surprise that becoming erect in such a short time can be painful. Honestly most people bulldoze through it but I will always encourage people to visit a professional such as a chiropractor. This situation, thankfully, lasts rarely more than a week to 10 days regardless of whether you visit a professional or not." Due to the increased discomfort and pain I was experiencing, I decided to stay at stage #4 for an extra week to see if my back pain would go away as Patrick had said it would. The back pain has subsided, but is still present. The effects of the inserts is most definitely no longer just neurological. At this point I can feel the changes in my posture and the muscles associated with making those changes. Also, the #5 insert is not only larger than the #4 one, it has an additional wide flange on it that significantly increases the 'width' of the pressure being exerted on the sole of my foot. At this point my feet are becoming more and more accustomed to the sensation of having something pressing into the bottom of them, but now the pressure 'point' has gone from being very centralized to being much wider - taking up most of the middle of my foot. I'm still dealing with the side effects of my posture being altered by this system, albeit for the better, so I'm going to stay at this level until such a time as my feet and body become acclimated. The laces on my shoes are getting progressively looser and looser as if my feet are ballooning up from the inside out. Of course this is not the case, it's merely the fact that my feet are being forced to sit higher up in the shoe than before. I wonder if there are any shoes designed to accomodate this? After three weeks of being at stage #5 I feel ready to progress on to the final level. At this stage I am already 3-4 weeks behind where the 'average' person might be if they were using this system. I'm glad that I decided to listen to my feet though and to progress at a level that was appropriate to my situation. Thankfully there is not much of an increase in insert size from #5 to #6. My feet are very pleased by this. In fact, levels #5 and #6 are almost the same when it comes to size and biomechanical impact, however the #6 is made from a viscose elastic product rather than an EVA product so that it will last longer - and as a result it feels 'firmer' underneath my sole. 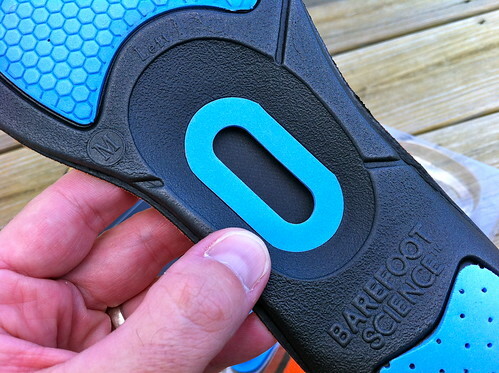 After so many weeks of using the Barefoot Science system, my feet are becoming very well used to the feel of the inserts. In fact I'm assuming that I will stay at this level for the foreseeable future? 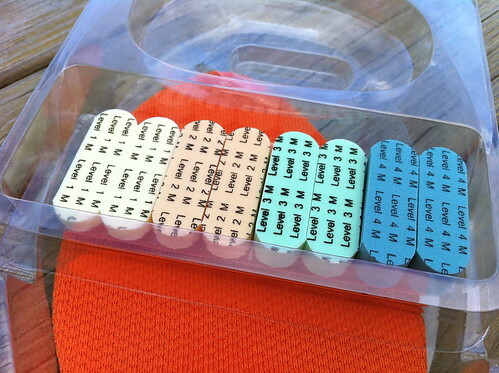 If I go back to not wearing the inserts at all, I'm worried that my feet will lapse back to their previous state and I've been through to much to let that happen. I started this system In december when the weather here in North Carolina was very cold. That made wearing traditional shoes all the time quite easy, but now that it's April and the weather is getting hotter I'm not sure how or even if I will be able to transfer this system over to my normal Summer shoes which are the Keen Newport H2 sandals? According to Patrick Malleret, once both feet have become acclimatized to the #6 insert, you should simply stay there unless you are a peak performance athlete - which I'm definitely not. So I will have to figure out a way to keep the #6 insert as part of my Summer footwear program. I was reluctant and skeptical of testing this system at the beginning. Based on my own research and some encouragement from Damien I decided to give it a shot, all the time expecting nothing out of it. It took far longer to progress through the different levels of inserts than the usage instructions suggested, but I'm so glad that I took the extra time and only progressed when it felt right. Toward the end of the program I could feel the difference in my overall posture and the way I walked on the outer edge of my feet instead of being flat footed. I also encountered a significant amount of lower back and body pain that required some attention from a chiropractor to work through. So was it all worth it? 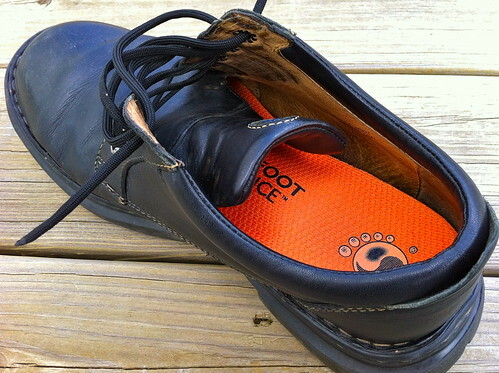 According to Patrick the inventor of the Barefoot Science system it's not uncommon for him to see up to a 36% reduction in a footprint after using this system to rehabilitate your feet. In order to have some form of tangible metric by which to gauge my own progress, I took an imprint of my bare foot at the very beginning of the system using my children's poster paint (left). As you can see the impression made by my foot clearly shows how little of an arch I had. Fast forward to 14+ weeks later and I repeated the same foot imprint exercise (right) to see if I could notice any visible improvements in the reduction of my footprint. Needless to say I was speechless to see the difference the inserts had made to my footprint in such a short amount of time! I don't have the technical equipment to give you exact percentages, but I think the pictures speak for themselves. At no point in my life can I remember having any form of arch to my feet. 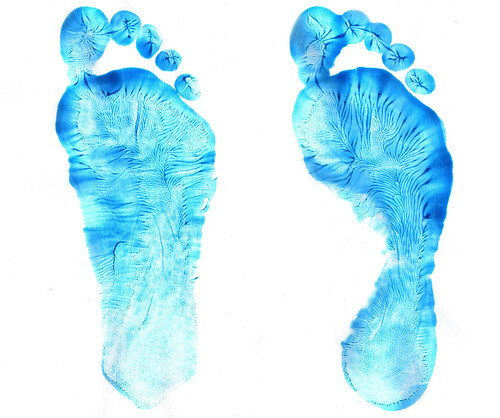 My earliest memories of running around bare foot as a kid was of seeing how different the shape of my wet footprints were to other children. Despite all of the pain and discomfort of the Barefoot Science system, this simple before and after picture proves to me that it was all worth it. For now I'm going to stick with the #6 insert for as long as I can get away with wearing traditional shoes or sneakers. I'm actually dreading moving to my Sandals and having to stop wearing the Barefoot Science inserts, I don't want to undo all of the good work that has been done. To any of you reading this and wondering if this would work for you, or if it's worth trying, I would say just do it! If you have any questions for me regarding my experience using the inserts, please leave a comment and I will be more than happy to follow up with you. Disclaimer: The author (Brian Green) was provided with a free sample of the Barefoot Science insoles via ToeSalad.com for testing purposes. Brian is an occasional contributor to ToeSalad and agreed to test the inserts on our behalf due to his pre-existing foot problems. He kindly agreed to document his results for this article. Brian Green is an avid lightweight backpacker and author of the popular Brian's Backpacking Blog. Originally from Southampton, England, Brian has lived in the US for over 14 years, finally settling in North Carolina. His love of the outdoors started at a very early age, almost as far back as he can remember. Now he spends as much time backpacking as his work schedule and family life will allow. Be sure to check out his blog for other great gear reviews and backpacking tips & tricks.